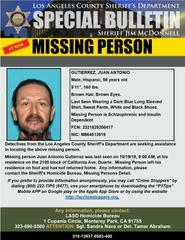 Los Angeles County Sheriff’s Department’s Missing Persons Unit detectives are seeking the public’s assistance in locating Juan Antonio Gutierrez. 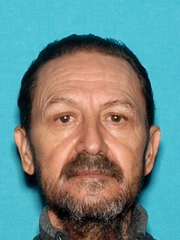 He is a 59 year-old male Hispanic who was last seen leaving his residence in Duarte, on Friday October 19, 2018 at 9:00 a.m.
Mr. Gutierrez is described as 5’11, 160 lbs., brown hair, and brown eyes. He was last seen wearing a dark blue long sleeved shirt, sweat pants, white and black shoes. He suffers from schizophrenia and is insulin dependent. His friends and family are very concerned and asking for the public’s assistance in located her/him.